This truly is a tour encompassing a broad spectrum of Europe. You will be shown a vast array of historic landmarks, places of interest and tremendous scenery. You will experience an array of differing and often contrasting places of interest and have the opportunity to fully immerse yourself in the local culture. You will take home with you memories of iconic and famous places which will stay with you forever. Cruise along the canals of Amsterdam and the River Rhine. Orientation of Amsterdam, Heidelberg and Lucerne. 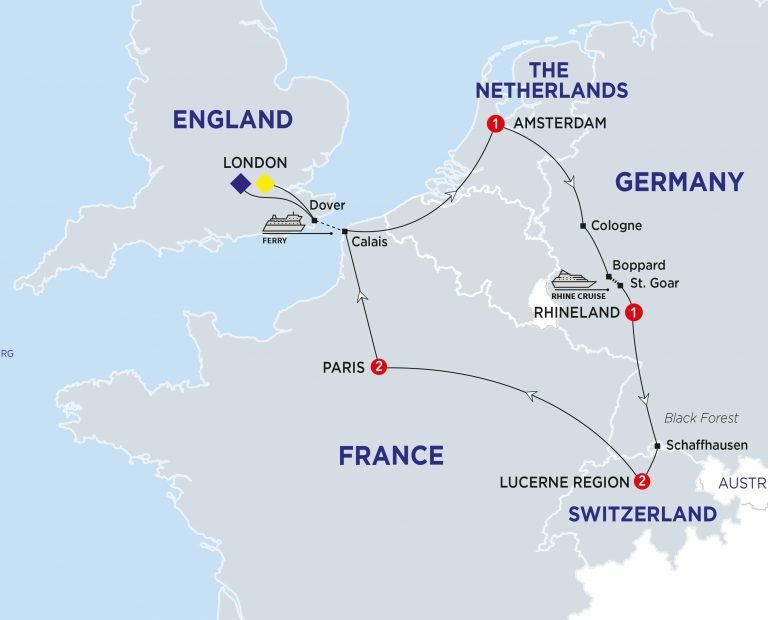 See the Lorelei Rock, Vineyards of Burgundy and the Somme Battlefields. View the White Cliffs of Dover. Visit the Rhine Falls in Schaffhausen. See the Lion Monument and the Chapel Bridge in Lucerne. Visit the Champs Élysées, Arc de Triomphe, Opera House and the Eiffel Tower in Paris. Say Farewell to the White Cliffs of Dover this morning as you head across the English Channel towards the French coast and the port town of Calais. Journey through Belgium and arrive in Amsterdam. Embark on a cruise of the city’s waterways where you can get to know your fellow travellers and talk with your Travel Director. The canal tour includes a complimentary dinner and a welcome drink. Today you will depart to St Goar by river cruise on the Rhine, passing splendid castles and abundant, terraced vineyards. Watch out for the Lorelei Rock so called after the mermaid of the same name who sang fishermen to their watery graves with her songs. Enjoy picturesque views of the River Neckar from the imposing Heidelberg Castle. In the afternoon, you will arrive at your hotel where you will dine and relax into the evening. Includes Buffet Breakfast and Dinner. The Black Forest is your dramatic backdrop for the morning with a cultural look at cuckoo clock making. You will visit the splendid falls at Schaffhausen and appreciate the largest waterfall in Europe. In the afternoon drive through beautiful alpine scenery to Switzerland and see panoramic views across Lake Lucerne. For the morning, you will take a stroll across the wooden Chapel Bridge, a 14th century covered structure containing painting on the interior. The Lion Monument remembers the mass killing of the Swiss Guards in 1792 and it well worth a visit. In the afternoon, spend some free time shopping in the old part of town, here you will find an array of souvenirs and special chocolate made in Switzerland. You may like to think about taking an optional experience up one of the local mountains for some fresh mountain air and some stunning alpine views. Cross into France today and drive through Alsace, noting the Maginot Line, a defense boundary constructed in the second world war to deter the advancing Germans. Enjoy the scenic Burgundy countryside where you will see the grapes being grown for the many varieties of wine produced in this region. Particularly famous being the Chardonnay and Pinot Noir vines. As you drive into the city of Paris you may like to consider having dinner and seeing a Parisian Cabaret for which the city is renowned. Enjoy dinner and cabaret, including wine and champagne, at the world-famous Moulin Rouge – the original Paris cabaret. Immortalised by the award-winning film of the same name, this Parisian institution features 60 dancers and entertainers and over 1000 costumes! The Arc de Triomphe, The Champs Élysées, and Opera House Magnifique. the former designed by Charles Garnier await you on this last full day of touring. View the gorgeous city from the second level of the Eiffel Tower. For the afternoon, you can either take a visit to the Palace of Versailles (Optional). Or spend the afternoon wandering Paris at your leisure. For the evening, a good-bye dinner at a local eatery. Includes Buffet Breakfast and Farewell Dinner. This morning bid farewell to Paris and travel across the solemn battlefields of the Somme. Watching out for the Canadian War Memorial on Vimy Ridge before boarding a ferry in Calais bound for Dover. Say Au Revoir to Europe and then look out for the welcoming sight of the white cliffs that signify the Uk. Arriving back in London with fantastic memories from your tour around Europe. Luxury air-conditioned coach with WiFi in most countries or alternative transportation (such as rail journeys). The services of a Local Host if you stay at our recommended London hotel. Return ferry across the Channel from Dover to Calais. Optional Experiences and free time. VIP entry to many sights.